There’s something special about the festive period. Wrapping presents, packing the car, buying your favourite foodie treats and heading off to spend quality time with family and friends. Recent Christmas break ideas include renting a cottage or house for a cosy Christmas. Now Beds on Board gives you a new, exciting Christmas break inspiration. Stay on a boat this Christmas in one of our lovely locations and experience the comfort of a little laid back luxury. Celebrate together with a unique place to stay in the UK or with something unusual on one of our short break destinations. 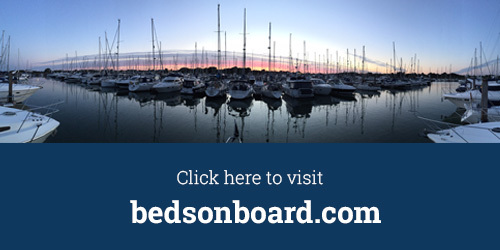 Whether you are looking to get away for an intimate and romantic holiday or perhaps want to stay on a larger boat big enough for the whole family (or even a group of friends), you will find it on bedsonboard.com. Make extra special memories this festive season. Breaking old habits and staying on a boat will reward you with a Christmas you’ll never forget. Here’s some inspiration for unforgettable Christmas holiday destinations. Enjoy this luxury widebeam houseboat located in Bath. With lots of interior space you will find that this boat offers a level of decor, spaciousness and comfort more akin to a floating cottage. With full gas central heating and a woodburning stove, you’ll be guaranteed to stay warm and cosy when it’s cold outside. Steeped in history and beautiful scenery, it’s impossible to imagine anything that isn’t special about Bath especially at Christmas time. One of the most popular Christmas break ideas. Just a short walk from Hampton Court Palace you can find this motor boat in Hampton Riviera surrounded by acres of natural untouched landscapes. Take a brisk walk with deer in Bushy Park, one of the Royal Parks just across the road. The historic Hampton Court Palace is a 10 minute walk, as well as many great bars and restaurants. The palm trees and serenity of this marina make this an absolutely stunning peaceful oasis within the M25. Yet it is only a short hop from the bright lights and sights of central London. If you want to be closer to the action here’s more London boats to stay on. Built to the highest standards by Royal Huisman Shipyard in Holland. She has generous guest accommodation comprising a full width master cabin and a triple cabin, each with full en-suite facilities. The large saloon and dining area together with her flybridge are ideal for entertaining. The location is stunning, moored on the end of the pontoon you have views of the Lymington River and the Isle of Wight. Lymington marina has a lovely restaurant on site and is 15 minutes walk away from the picturesque town of Lymington, with it’s quaint bars and restaurants. If Christmas shopping and the bustle of the city is more your thing then this marina is located between Southampton and Bournemouth. A fantastic Fairline Squadron 58 motorboat in the beautiful bay of Port De Mallorca in Palma. With 3 cabins (sleeps 6) and plenty of living space this is a perfect place to spend some time relaxing on your festive break in some short haul sunshine. Port De Mallorca is accessed via private gates with 24.7 security and is near fantastic incredible restaurants and eateries for your festive celebrations. For more Christmas break ideas take a look at our other boats to stay on in Palma and enjoy some festive sunshine. Enjoy the winter sunshine on board your own superyacht on the French Riviera. With over 100 meters of living space this is the perfect option for those looking for a luxurious Christmas break idea with friends or family. Often bathed in warming winter rays, the glitz and glamour of the towns of Cannes, St Tropez and Antibes offer the perfect antidote to a bleak midwinter. Search here for more boats in the South of France. Aria is THE Christmas break experience! Whether you are looking to enjoy a busy town, secluded beach or a horizon of volcanic islands. Surrounded by the dazzling waters of the Mediterranean, staying on a boat in Malta will give you a unique, intimate getaway this Christmas. Malta’s bars, restaurants and shops are just a short walk away in the town of Vittoriosa. Or how about a festive flutter at the famous Casino di Venezia? Aria’s impressive space and facilities make her the ideal yacht for entertaining with family and friends this Christmas. For a more intimate experience, chose to stay on this motor boat moored near St Tropez. With 2 cabins this boat offers a cozy yet comfortable seasonal getaway in the South of France. Enjoy and unwind, make use of the marina facilities including pool, restaurants a beach and shops. Of course with the glamour of St tropez just a stone’s throw away there will be plenty of time to indulge and take in the sights and sounds of this world renowned town on the french Riviera. Barcelona, the cosmopolitan capital of Spain’s Catalonia region. It is defined by quirky art and architecture, imaginative food and vibrant street life. It has medieval roots with a modern personality. Its restaurant scene, anchored by the central Boqueria market, ranges from fine dining to tiny tapas bars. Soft golden beaches, bars, clubs and historic attractions welcome you as you explore this fantastic city break. This spacious and modern yacht will sleep up to 6 people in 3 double cabins and is perfect for entertaining the family with a large airy saloon. The UNESCO World heritage city of Bruges is just walking distance from this recently converted and spacious ‘hotelship’. With a large dining room, open living area and 3 ensuite bedrooms staying on this boat for your Christmas getaway offers the perfect festive family escape. Christmas markets deliver the ultimate seasonal shopping experience set amidst the picture postcard backdrop of the city. The beauty of staying on this boat is that it is moored in the comparative calm of Cap d’Ail on the outskirts of Monaco. Cap d’Ail has been listed as a health resort since 1921. The quality of its seawater has earned it the Blue Flag for its 3 beaches, one of which slopes down gently to the sea and is easy to reach. With a warm winter climate and tranquil surroundings this boat offers the ideal opportunity for more peaceful Christmas break ideas. The advantage of staying on a catamaran is the amount of space it affords its guests. The boat offers very generous living space and has 4 ensuite double cabins plus 2 separate cabins. The spacious and sunny living room gives 360 degree panoramic views of the winter sunshine. Alimos marina is the biggest marina in South east Europe offering all amenities you could need. Athens city centre is a short 8 euro fare. At a great price tag staying on this yacht in Athens offers the perfect Christmas getaway for larger families and groups. Get some inspiration for a Christmas break staying on board a boat this winter. Our unique Christmas break ideas offer a perfect alternative for a festive escape with a difference. Boats give the flexibility for Christmas breaks of families and groups of friends yet are also ideal for more intimate breaks. Do something different this year and stay on a boat with bedsonboard.com for an unforgettable Christmas. Start you research now and find your perfect destination.